Sixty-six million years ago, an asteroid more than five miles wide smashed into the Earth at 70,000 miles per hour, instantly vaporizing upon impact. The strike obliterated most terrestrial life, including the dinosaurs, in a geological instant: Heavy dust blocked out the sun, setting off a cataclysmic chain of events from the bottom of the food chain to the top, killing off more than three-quarters of Earth's species—or so the popular theory goes. The team precisely dated rocks from the Deccan Traps—a region of west-central India that preserves remnants of one of the largest volcanic eruptions on Earth. Based on their analysis, the researchers determined that the eruption began 250,000 years before the asteroid strike and continued for 500,000 years after the giant impact, spewing a total of 1.5 million square kilometers of lava. The immense and long-lasting volcanism may have released dangerous levels of volatile chemicals into the air, poisoning the atmosphere and oceans. "If models of volatile release are correct, we're talking about something similar to what's happening today: lots of carbon dioxide being emitted into the atmosphere very rapidly," says Michael Eddy, a graduate student in MIT's Department of Earth, Atmospheric and Planetary Sciences (EAPS). "Ultimately what that can do is lead to ocean acidification, killing a significant portion of plankton—the base of the food chain. If you wipe them out, then you'd have catastrophic effects." 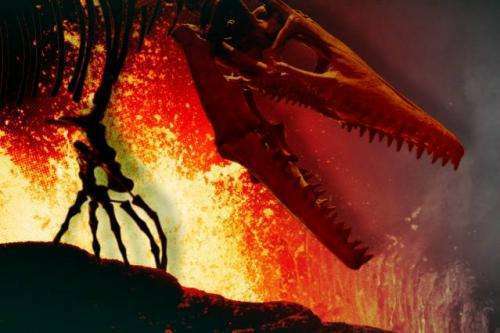 Based on the new, more precise dates for the Deccan Traps, the researchers believe the massive eruptions may have played a significant role in extinguishing the dinosaurs—although the exact kill mechanism may never be known. "I don't think the debate will ever go away," says Sam Bowring, the Robert R. Shrock Professor of Earth and Planetary Sciences at MIT. "The [asteroid] impact may have caused the extinction. But perhaps its effect was enhanced because things were softened up a bit by the eruption of these volcanoes." Bowring and Eddy are authors of a paper published in Science, along with colleagues at Princeton University, the University of Lausanne in Switzerland, and Amravati University in India. Prior to 1980, the exact cause of dinosaurs' demise was unknown; one hypothesis proposed that they were killed off by massive volcanic eruptions. (Similar episodes have subsequently been shown to have played a role in two other mass extinctions, the end-Permian and end-Triassic.) But the 1980 discovery in Italy of iridium, a rare element primarily found in extraterrestrial materials, suggested otherwise. "They eventually found a crater in the early '90s, so the smoking gun of the story seemed to be perfect: An asteroid caused the mass extinction," Eddy says. "In fact, a few people have suggested that there is evidence for environmental degradation before the impact." It's long been known that a major eruption occurred in India around the time of the end-Cretaceous extinction, but this event had never been precisely dated. The MIT and Princeton researchers used high-precision geochronology to determine the age of rocks in the Deccan Traps, to evaluate whether the eruptions began before the extinction—a necessity, if volcanism was indeed the cause. "The story that is emerging is that perhaps both might have been involved," Bowring says. "Perhaps the end of the dinosaurs was caused by a one-two punch." For two weeks, the researchers looked for volcanic rocks that might contain zircon—a uranium-containing mineral that forms in magma shortly after an eruption, and that can be used as a very precise clock for determining the age of rocks; the mineral typically crystallizes in magma containing high amounts of silica and zirconium. The researchers collected more than 50 samples of rocks from the region representing the largest pulse of volcanism. Fortunately, samples from both the bottom and top of this volcanic layer contained zircon, allowing the team to pinpoint the timing of the beginning and end of the Deccan Traps eruptions. The researchers analyzed the rocks separately at Princeton and MIT to make sure the dates determined in one lab could be replicated in another lab. In both laboratories, the scientists pulverized rocks and separated out millimeter-length grains of zircon. To determine the age of zircon, and the rock from which it came, the teams measured the ratio of uranium to lead isotopes. The group's analysis indicates that the region of the Deccan Traps started erupting 250,000 years before the asteroid strike, continuing for another 500,000 years after the impact. "We have 750,000 years as the duration for the main pulse of volcanism, but it'd be nice to know whether that time represents a constant flux of magma, or if pulses of magmatism were erupted over an even shorter period of time," Eddy says. "Can we pick things apart at the 10,000-year level and see correlations between an individual pulse of volcanism and environmental change? That's where we need to go with this study." Adds Bowring: "We're getting better and better at dating mass-extinction events, but we're not having a comparable improvement in our understanding of what caused them. Now that the timing is so well-resolved, I think there will be people coming back to think about the cause with new vigor." They are implying a time resolution of better than 1 part in a thousand! Do they give error bars in the article? Do they discuss the propagation of errors? I've always wondered if the Deccan trap eruption wasn't triggered by the asteroid impact. The paper is paywalled, you can rent for one day for $20. Many scientist have "wondered" if the trap eruption wasn't triggered by the asteroid impact. Zircon dating has been shown to be quite reliable. Radioactive decay is very well understood as are it's implications in geology. 66 million years really isn't that long ago. "If models of volatile release are correct, we're talking about something similar to what's happening today: lots of carbon dioxide being emitted into the atmosphere very rapidly,"
Just had to toss in a wild bad theory! Total BS! That assumption only applies if the decay has not been affected by any unknown influences, and yes all those assumptions have many implications. No cantdrive, the decay rates of atoms didn't change after the dinosaurs went extinct. Some decay rates are variable. How researchers understand the initial ratio of radioactive isotopes in zirkon to determine the exact age? And what prevents these radioactive isotopes to be washed out over time by water or weak bases or acids that are formed in nature in a natural way? To be precise isotopic clock should be known the exact initial ratio of the isotopes in the sample and the lack of physical and chemical effects on it during supposed period. Supporters of evolution dated samples according to the layers in which they are found, and the layers according to the samples that are found in them. This method can be you can guess is not very accurate, if we can be called scientific method. Google is your friend---If you're intelligent enough to know how---which I doubt. The idea that volcanic eruptions on the other side of the earth can be triggered by an asteroid impact is, well, highly likely. The issue here is the period of time for the creation of the Deccan Traps. If true, seventy five thousand years seems unlikely for eruptions caused by a single event measured in minutes or hours. @eachus A viscoelastic sphere that is struck impulsively at some point on the surface generates a shock wave that focuses on the exact opposite side of the sphere. This would be the mechanism for a rupture on the other side of the earth. Of course, if a sufficiently large rupture occured due to the shockwave one might have vulcanism for a long time. No expert on that. Very curious. People are expected to simply believe that dinosaurs went extinct 65 million years ago from a meteor or something of that nature, and yet there are many dinosaur fossil graveyards that clearly show they were buried by a watery cataclysm, along with many other types of animals that are still alive today. Shootist had it correct. And radiometry is merely believed to be reliable, when in fact it is not. From our analysis of the Cassini RTG power data, we find no evidence of a solar-influenced decay anomaly for 238Pu having the inverse-power-law form given by Eq. (2) for n=1–5.